Now FDA Approved – RADIESSE for the Hands! While the face is the number one indicator of age the hands are second. How long do treatment effects last? 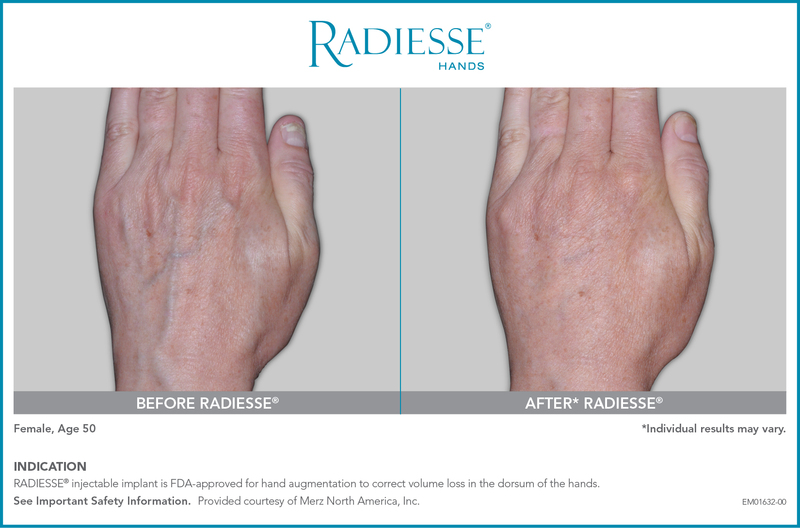 What are some benefits of RADIESSE that have been shown in clinical studies? 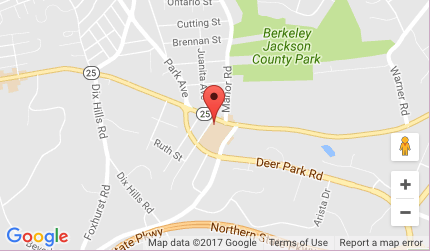 What can I expect to happen at a treatment session? Your doctor will ask you questions about your medical history. Remove all jewelry such as rings before injection. Do not put on jewelry until your hands are no longer swollen. Your doctor will clean the area where the injections will be given. You and your doctor will determine if a topical or local anesthetic is needed. Your doctor will inject small amounts of RADIESSE® into the skin in multiple areas across the back of your hand using a thin needle until you have received the desired correction. Your doctor may gently massage the treatment area to ensure the product is evenly distributed. Your doctor may periodically apply an ice pack to the treatment area to help reduce swelling. Your doctor will give you specific after-treatment care instructions. How many treatments are required to get the look I want? 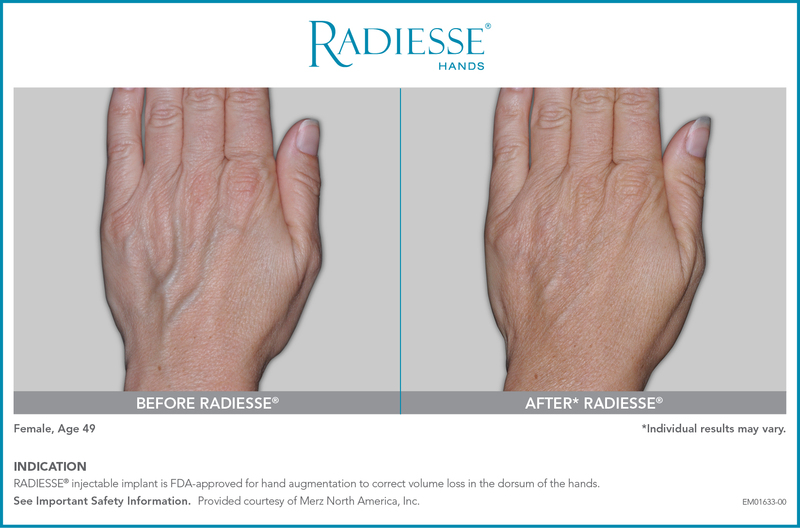 Who should not use RADIESSE? You should not use RADIESSE if you have an allergy to any component of the product, if you have a bleeding disorder, or if you are pregnant or breastfeeding. What is the most important information I should know about RADIESSE? What should I tell my doctor before taking RADIESSE? 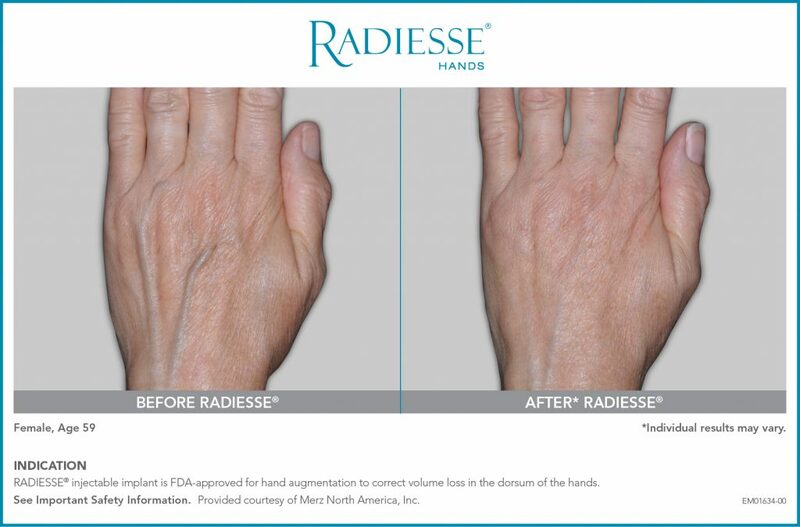 What are the most common adverse events with RADIESSE?